Huddersfield Town head coach David Wagner (Picture: Mike Egerton/PA Wire). HEAD COACH David Wagner said he takes full responsibility for Huddersfield Town’s plight at the foot of the Premier League. Huddersfield have lost a club record nine straight matches in all competitions and lie eight points adrift of safety having won only two league games this season. The Terriers’ boss said injuries and suspensions had not helped his cause and that seven of those nine defeats had been by a solitary goal, but the German insisted the buck stops with him. “I know this is part of the job and I know that it is my responsibility,” Wagner said. “This is the truth. Since I arrived I have had responsibility for this football club and this means not only the three years, but the last six weeks as well. “They were not what we wanted or matched the ambitions I had and I’m responsible for it. “As I said I’m responsible for everything that happened before these six weeks and also for what has happened during them. I’m responsible for everything that happened before these six weeks and also for what has happened during them. This is what I take on the chin. All together, individually, every player has to take it on the chin, step up and take responsibility for what is in front of us. On Saturday the Terriers travel to relegation rivals Cardiff City, who sit one place above the bottom three, eight points ahead of Wagner’s side. 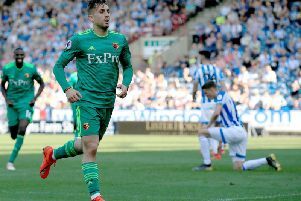 A tenth successive Huddersfield defeat could see the points gap between them and safety extended to double figures and Wagner agreed it was a game his side had to win. “Yes, I would think so. The longer you don’t have the winning feeling, the more desperate you get,” he said. Town chairman Dean Hoyle declared he would not allow the club to “sleepwalk towards relegation” in a statement released on New Year’s Eve. When asked if Town had an offer for striker Shinji Okazaki turned down by Leicester, the Wagner added: “There is nothing significant to say where there is something around the corner.